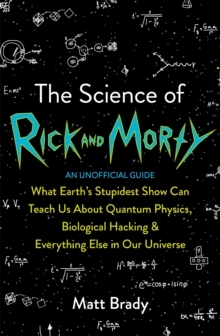 Learn about quantum physics, cloning, exoplanets, the number 137 and all of modern science's biggest questions through the crazy adventures of Rick and Morty, the international Netflix success, now airing on Channel 4. What is concentrated Dark Matter?Can we hack memory?Are you living in a simulation operating at 5% capacity?Rick and Morty may seem like the most idiotic show on TV today, but a lot of its crazy adventures are actually based on real-life scientific theories and cutting-edge academic research. Using the biology, chemistry and physics of the series, expert science writer Matt Brady explains the biggest questions occupying the greatest minds today, including: can we have cool cybernetic implants, will we ever be able to alter our basic intelligence, how far will we be able to go with cloning, could we travel to parallel universes, what energy could you get from a microverse battery and can you control a cockroach's nervous system with your tongue?So, become more Rick and less Morty with this wander through the portal of modern-day science. Or just go back to laughing at the stupid jokes.